This "Historically Speaking" column was published in the Exeter News-Letter on Friday, October 12, 2018. At 29, Sarah Nicholl was not as young as her classmates when she arrived at the Exeter Nurse’s Training School in 1917. Born in 1888, in Annapolis Royal, Nova Scotia, she’d been recruited by the school, as other student nurses were, specifically because she was “from away” and would therefore be a bit detached from the local patients. Her affiliation with Exeter Hospital would last four decades. 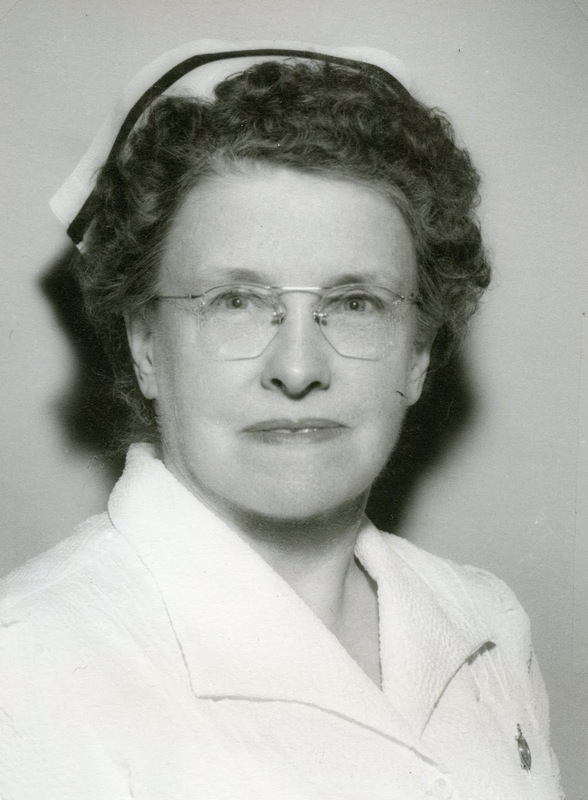 At the time of her retirement in 1957, the Portsmouth Herald noted, “After graduation (which occurred in 1920) she remained as a regular duty nurse, then was advanced to head nurse, supervisor, assistant superintendent and finally superintendent.” She did all this by 1925 – roughly a promotion every year until she reached the top administrative post at the age of 34. The job of superintendent was generally considered a woman’s position. Filled since the early days of Exeter Hospital by an RN, the job was described by the Trustees in 1909: “the duties of the superintendent are many and varied. In addition to her grave responsibilities for the sick under her care, she has the personal oversight of everything pertaining to the hospital, indoors and out. She looks after the kitchen, orders supplies, keeps the accounts and attends to the thousand and one things constantly arising in such an establishment.” Of course, we have to remember that the hospital at that time was considered a place where doctors could ‘park’ their patients with the understanding that they would be taken care of by well-trained staff. It was a step above keeping the patient at home with an attentive mother. Nurses trained at the hospital were taught how to care for medical and surgical patients but they also attended lectures entitled, “Instruction in Reading Aloud,” “Massage” and “Dietetics and Cooking Lessons.” The administrative side of the job was not addressed. Sarah Nicholl must have been the type of person who came to that naturally. 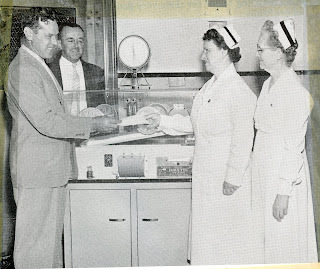 The training school acted as a feeder for the nursing staff at the hospital. Student nurses filled some of the positions and most remained with the hospital after graduation. Sarah Nicholl depended on the graduates to fill her own administrative staff. In time, the Nursing, OR and night supervisors would all be drawn from the program’s own alumnae. Exeter trained nurses also staffed Phillips Exeter Academy’s Lamont Infirmary. During her tenure, standards for nursing expanded and the more frivolous coursework was eliminated. Students were required to do rotations at other hospitals, as Exeter didn’t have a psychiatric unit. To fully qualify as a registered nurse, the students needed to pass the NH State nursing examination. Nicholl’s standards were rigorous, but they needed to be. In 1934, after it was determined that the Exeter School required too much assistance from other institutions, the school stopped accepting new students. The school’s closure, however, did not stop Nicholl from educating her staff. Her written reports to the Trustees, which always included detailed admission and discharge statistics, also include the seminars, workshops, coursework and professional affiliations of her staff. She herself continued her education by attending the annual Institute for Hospital Administrators at Harvard Medical School, sponsored by the American College of Hospital Administrators and joined that organization. Low staffing during World War II was a problem. Nicholl enlisted the help of Red Cross nurse’s aides. She continually requested more staff for the laboratory and x-ray department and hired a certified dietitian to take over the cooking. She was such a careful administrator at Exeter Hospital that Nancy Merrill, herself a former nurse, would write of her in History of Exeter, New Hampshire 1888-1988, “It was said she knew what size light bulb was needed in each socket.” She thanked her staff in every report she filed. In 1957, after 40 years affiliation with Exeter Hospital, Sarah Nicholl decided to retire. In 1940, she’d reported to the US census that she earned $1800 in 1939 for 52 weeks of work. During her entire tenure, she’d lived on-site. “Miss Nicholl, had a small apartment in the hospital itself,” recalled Polly Kenick, who said it was, “like a penthouse to us students...on the 2nd floor of the hospital.” After her retirement, Nicholl – who had become a naturalized US citizen in the 1930s – returned to her native Nova Scotia. The position of Hospital Superintendent was also retired. The new person in charge – a man named Vernon Rich – was hired as ‘Administrator.’ Such was her tenure appreciated, that the trustees granted her a life income the following year. Photos: Sarah Nicholl, RN, served as Superintendent of Exeter Hospital from 1925 until her retirement in 1957. Hospital Superintendent, Sarah Nicholl RN, accepts a donated incubator for Exeter Hospital from the Exeter Lions Club.